Revolution Six abusing this site? Once again Rev The troll from froggy land is up to old snobby tricks in Epiphone country... Please share you opinions on the subject.. Here's a bump to remind people what the troll considers good workmanship. 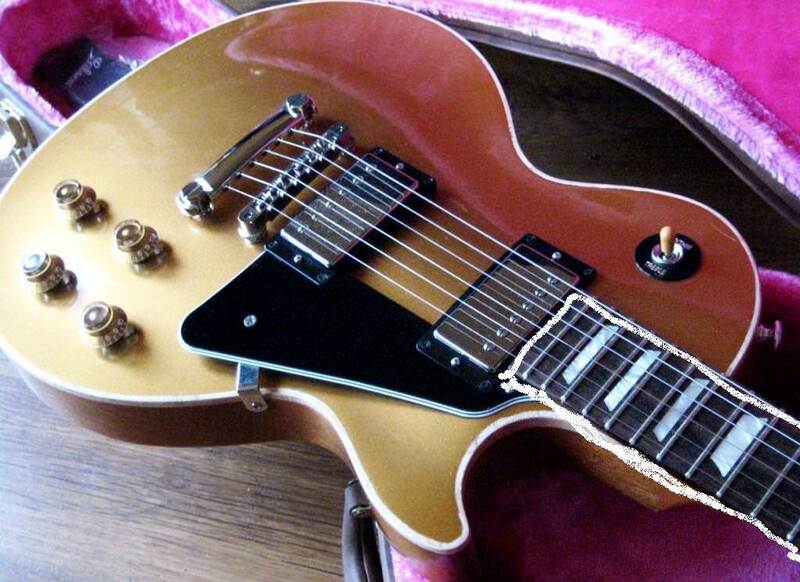 This is his Gibson lp that HE cut and glued PAPER binding to. Obviously not the bit on the fret board the been drawn on the photo but the binding around the body he genuinely did himself then proudly showed off in the USA board. Don't listen to him, he obviously has no idea. I'm relatively new to the forum and up to now I've found Rev6 single-mindedness somewhat amusing, so I've held off on complaining. But his recent slew of pointless posts has me wondering if potentially valuable new members aren't being turned away by his disturbing fetish with veneer. Someone looking at this forum for the first time seeking information or discussion about Epiphone isn't going to be very impressed if 4 out of the 5 most recent posts are just troll droppings. So, yes, I say he should be banned. And may all his finishes in life turn out to be photoflame! On second thought, as an alternative to outright banishment, perhaps the moderator could set up a locked thread just for Rev 6's posts. Kinda like a glass jail cell where he could rant and rave all he wants about Epiphone, the Chinese, and veneer. And may all his finishes in life turn out to be photoflame! Rev is back on the attack again after a day peace... I guess he just doesn't get that we don't want him here.. It has nothing to do with autism. I'm a Sp. Ed. Teacher. I work with kids that have autism. Your comment gives folks the wrong idea of what autism is. Rev. 6 shows no signs of autism. I'm sure Pinch meant no offense to your students, but I agree with your point. From your experience, how would you approach educating someone with an unhealthy obsession with veneer? Can it actually be done? Brad, being a father of a child with autism (Aspergers) I do see some signs. Especially with the antisocial behavior and the fixation with Epiphones being copies and "photo flame". If he is in the spectrum, it appears that his issues may have been ignored and he was not placed with a teacher like yourself that could teach him how to behave socially. We do not know how old Rev 6 is, but if he is in his mid to late 30s and his parents didn't do there job properly, he probably has never been diagnosed and left to do what he does. I'm not a teacher like yourself, but a Dad that is very active with his special needs child and took the time to educate himself. I also know that it takes a very special person to do the job you do and I applaud Special Ed teaches for what they do, its a very difficult job. Thanks Brad for being there for those children. I think people that do what he is doing are seeking some kind of emotional payoff from it. As you know, this does not fit most on the spectrum. Most with autism do not have emotions play into their fixations as such. I have also worked with adults who are autistic. My classroom aid is a 59 year old male who has autism himself. I don't see a person who has autism as someone who would be a troll, or who would get any sort of pleasure in doing what Rev. 6 is doing. To me, that kind of person is someone who has more of a neurosis or worse. It could be something to do with obsessive or compulsive type of behavior as well. But I am not a psychologist. And of course....I could be completely wrong. This is just my own opinion. Thanks for the kind words about my job. It is pretty tough sometimes. Same situation here Bill...fun ain't it, but I think we can do without it becoming a default diagnosis for someone who may just be knob, and maybe in his country the boundaries of what is considered funny may be different (though I'm going with the former). We use a special ed school and indeed they do a great job! Well, for whatever reason, he's a pain in the arse. Especially when somebody comes on excited about a new guitar they purchased. I'm going to continue to ignore him. I have a nephew with autism, he is in his twenties now and has been on many different trial med programs. My girl friend is a substitute teacher and frequently fills in with Special Ed classes, it can be very difficult for everyone involved, my hat is off to all who have the skills to help.. It is a shame that Rev doesn't seem to have the moral fiber to behave himself and cause us frustration to point where we may say things that are offensive other members. where's the dead horse pic? ?